The Good: Edwin Jackson started off rough, but rebounded for a quality start against a very weak Marlins offense. Schierholtz and Valbuena went yard, with Valbuena’s being the decider in the game. David DeJesus, Welington Castillo, and Schierholtz also added doubles, with Castillo’s driving in a run. 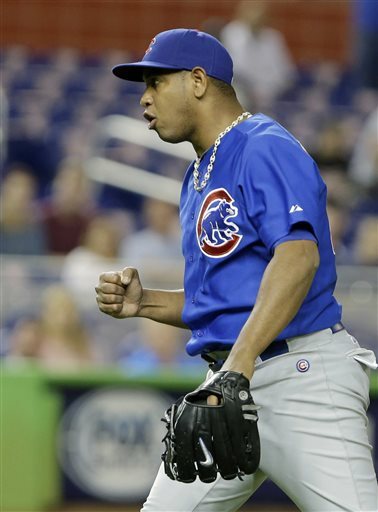 Carlos Marmol notched his second save, but it wasn’t pretty. The Bad: Schierholtz was the only Cub with multiple hits. The Cubs allowed three runs to the Marlins, which doesn’t seem like a lot, but it is when you take into account the fact that the Marlins have scored 1 or 0 runs in 11 of their first 21 games this season. The Ugly: Anthony Rizzo continued his struggles at the plate, going 0-4 with 3 strikeouts. The Stat: Darwin Barney, who also went hitless, lowered his average to a paltry .129. Notes: Ian Stewart could find himself on the bench when he returns from the DL, as Valbuena has hit very well. The two teams will meet again tomorrow at 6:10.